With just two weeks of regular season play remaining, the race for PFFs Rookie of the Year award is as tight as it’s ever been, with players on both sides of the football making a late push to take home the prize. Our current leaders are have been right in the thick of the race all season long, but after 15 weeks it’s just too close to call. Just like we have posted every Wednesday since Week 1, here are the top-20 candidates in PFFs Race for Rookie of the Year. Lindsay ranks 14th out of 66 running backs who’ve seen at least 200 offensive snaps this season in terms of overall grade, with his 82.6 rushing grade checking in at ninth. Lindsay is tied for third among running backs with 29 runs that have gone for at least 10 yards, and he’s picked up either a first down or touchdown on 31.3% of his rush attempts this year, which is good for eighth among running backs with at least 50 attempts. Reid’s overall grade of 78.9 currently ranks 13th among the 85 qualifying players at the position, while his coverage grade of 79.7 is good for 16th. The first-year safety has forced an incompletion either by either an interception, a pass breakup or close coverage on 23.1% of his coverage snaps this year, which is the league’s third-best rate among safeties with at least 25 targets in coverage, and his 10 total defensive stops are tied for the fifth-most among all rookies at the position. 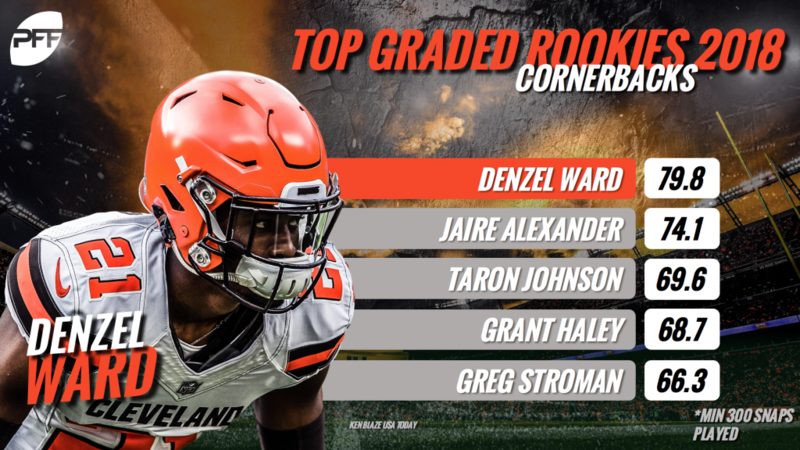 Ward currently ranks 12th out of 116 qualifying cornerbacks in terms of overall grade, and his 84.8 coverage grade ranks fifth. Simply put, Ward has been put to the test as a rookie. The 77 targets into his coverage this season are the 16th-most seen by any corner this year, and challenging him hasn’t gone all that well for opposing QBs, as the 70.0 passer rating he’s allowed into his coverage is the sixth-lowest allowed among the 70 corners who’ve seen at least 50 targets into their coverage.